For all of your exterior house cleaning services in Surrey, turn to the professionals at Shack Shine! We’re dedicated to ensuring you have the shiniest home on the block! When you call our team, our experienced technicians arrive at your home ready to go in shiny, clean trucks. 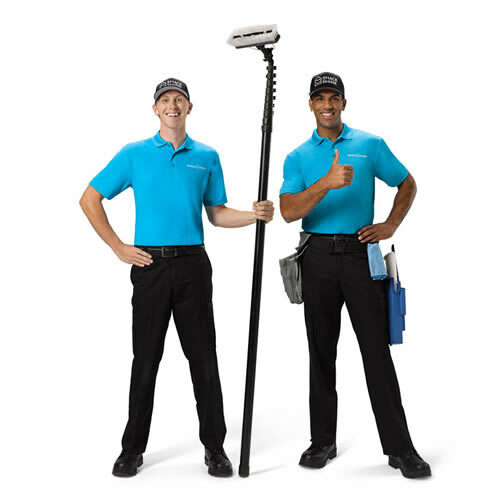 What’s more, our friendly, uniformed technicians will handle all of your house detailing needs in Surrey in a single, detailed visit. We’re shining your neighbourhood, one home at a time. Who doesn’t want clean windows? As a part of our Surrey house detailing service, our uniformed technicians will clean the interior and exterior of your windows. We even reach those out of the way and hard to reach windows. We’ll wipe down exterior frames and screens as a part of the service we offer. We’re the home detailing you can trust – we make it easy to book and even easier to recommend our services because we do what we promise. For homes in Surrey, gutter cleaning services from Shack Shine can make all of the difference. No one likes to climb on a ladder and pull out leaves and debris from their gutters. Our technicians are skilled to help remove the debris and dirt from your gutters, wipe down the exteriors, and clean up anything left behind. Because we use large vacuums on water-fed poles, there’s no risk to balancing on a ladder for our team. Cleaning the roof isn’t just going to create that shiny, like-new look that homeowners love. It will also help to reduce the risk of early deterioration to your roofing tiles and shingles. Shack Shine’s Surrey roof cleaning service can tackle most common types of roofing, brightening up that dull look and giving you a shiny home. It’s a fantastic way to add instant curb appeal to your home. Power washing is an economical and fantastic way of removing dirt and grime from most of the horizontal surfaces around your home. Our goal is to scrub the siding, driveway, and other surfaces with this very safe method. We don’t use any chemicals either, which means your landscaping is protected. We’ll even move your home furnishings out of the way and replace them when we are done. You don’t have to lift a finger. Pressure washing is another of the key services we offer as a part of our exterior house cleaning services in Surrey. Pressure washing is an excellent way to remove grime, debris, and even moss, mildew, and mold from the exterior of your home. We can use pressure washing on most hard surfaces around your home, creating a like-new look in no time. Making your home smile means tackling all of those unsightly stains in the driveway and removing the grime that’s embedded on your patio. We do it all with a smile. House washing is a big deal. No one wants to have a home that’s dirty or looking dingy. You don’t have to when you put Shack Shine to work. Our technicians will use high powered pressure and hand scrubbing to remove debris from your home in a safe, gentle manner. We can use this method on most types of surfaces and create a like-new look. Your home will love you when we’re done with it. To achieve this, we use water-fed poles and hand scrubbing to remove the debris and dirt embedded on your home. In Surrey, exterior house cleaning services like this can help not only give you the best looking home on the block, but also help prevent early deterioration. We’re excited to offer you our residential Christmas light supply and installation service. We offer commercial grade Christmas lights that are energy efficient—uses less energy than store-bought Christmas lights. Our Christmas lights come in a variety of shapes and colors to best suit your home. It’s a smart investment that will keep your home shining brightly for many holiday seasons to come.